Driver will pick you up from Goa Airport / Railway station / Bus stand . Churches Basilica of Bom Jesus, Se Cathedral, Lunch - halt at old Goa ,Dona Paula bay, and the lovely Miramar Beach. 1. Fort agauda: Fort Aguada and its lighthouse is a well-preserved seventeenth-century Portuguese fort standing in Goa. 3. Calangute Beach:It is named as “queen of beaches” by many tourists. Shopaholics—big showrooms of graceful handicrafts from Indonesia, Tibet and Kashmir are lined up on the main road alongside the beach. 4. Baga beach: Baga a seaside town in Bardez, Goa, India. It comes under the jurisdiction of Calangute, which is 2km south. Baga is known for its popular beach and Baga Creek. It is visited by thousands of tourists annually. Check-out the hotel after breakfast, that driver will drop you at Goa Airport. Souvenirs after which you will be transferred to Goa & back to home. Airport / Railway Station transfers by Scheduled vehicle. Hotel transfers by Scheduled vehicle. Meal plan : BreakfastOne day South Goa Sightseeing by Scheduled Vehicle. 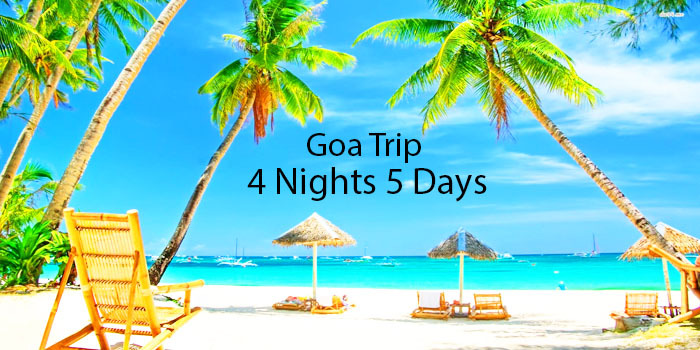 * One day North Goa Sightseeing by Scheduled Vehicle. * Any Airfare, Train fare, Overland Journey which is not mentioned in the Itinerary. * Any personal nature items like Laundry, bar bills, table bills, camera fee, tips or any other item. * Any Medical /rescue evacuation due to mishaps. * Any other things that is not included in the “Package Cost Includes” Column.